• Hair- it leaves your hair stinking of smoke. • Brain- increased risk of stroke. • Eyes- prone to stings, watery eyes, and increased blinking. • Lungs- increased risk of cancer. Aggravates pre-existing respiratory problems like asthma, breathlessness, and emphysema. • Heart- clogs the arteries and weakens them, and increases risk of heart attacks. • Women- affects the uterus of pregnant women by reducing the size of the uterus, leading to low birth weight among babies or sudden infant death syndrome after birth. • Brain- possible association with brain tumors and long term mental effects. • Ears- middle ear infection. • Lungs- prone to asthma induction and decreased lung infections. • Heart- increased nicotine receptors, leading to smoking addiction. • Blood- possible association with cancer. • Secondhand smoke exposure can be measured by testing indoor air for nicotine or other chemicals. Exposure to secondhand smoke can also be tested by measuring the levels of cotinine (formed when nicotine breaks down) in a nonsmoker's blood, saliva, or urine. 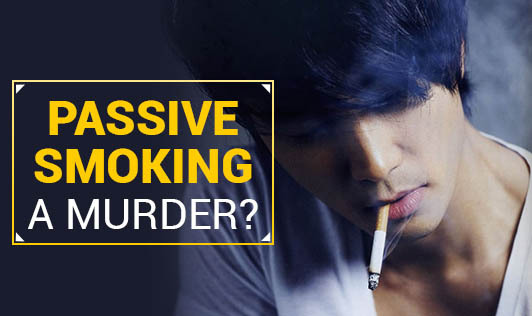 • There is no safe level of exposure to tobacco smoke. • Second-hand smoke causes 600,000 premature deaths per year. • Approximately 300,000 cases of infants and toddlers with respiratory diseases are reported every year, caused due to passive smoking. • Non-smokers exposed to passive smoking are at 20 to 30% increased risk of developing lung cancer. • Serious passive smoking effects include increasing the risk of breast cancer by about 70%, among women who are in the pre-menopausal stages. • More than 4000 chemicals are identified from secondhand smoke, out of which at least 250 are known to be harmful. • Young adults exposed to secondhand smoke at home are one-and-a-half to two times more likely to start smoking than those who are not exposed. • Of the 100 most populous cities, only 22 are smoke-free. Let us raise our voices against smoking in public and protect ourselves from secondhand smoke . Make INDIA SMOKE FREE!